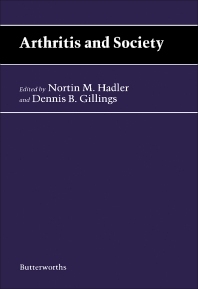 Arthritis and Society examines the interaction between the structure of our society and the impact of rheumatic diseases on the lifestyle of those afflicted. It has drawn the distinction between the private and public experience of illness in order to produce a comprehensive analysis of the impact of musculoskeletal disease on society. This book is organized into three main sections. Section 1 analyzes the personal experience of pain of the groups frequently afflicted and discusses the epidemiology and scope of the systemic rheumatic diseases. Section 2 views the plight of those suffering from rheumatic disease from a different perspective. Section 3 highlights the importance of appropriate care and of establishing a more compassionate society which can help lessen the impact of the disease. It also considers the role of rehabilitation. This book will be of interest to people dealing with studies on arthritis and other rheumatic disease and also those interested in understanding the impact on societal structure on healthcare issues. 6 The Recognition of the Illness Of Work Incapacity: An Exercise in Diagnosis or Adjudication?